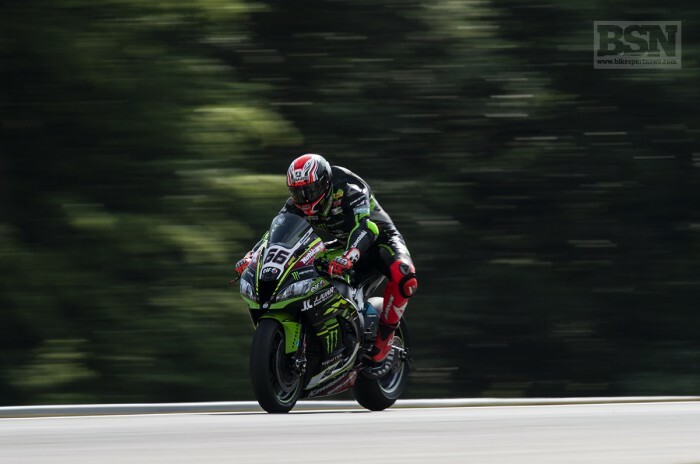 Superpole number 45 came along for Tom Sykes at Brno, putting him even further ahead in this particular aspect of WorldSBK competition – but one pole became third place and Sykes was seven seconds behind his own team-mate Jonathan Rea and the win. Sykes will be looking for a bike that turns better in race two than his bike did today, to utilise all of his rear traction. He ended up having to look behind for a long time as Alex Lowes was right with him, before the Yamaha rider dropped to fifth, and Michael van der Mark finished fourth, four seconds from Sykes. “I was watching my board and listening to my tyres really, I did not want to push too much in the middle of the race and lay too much rubber on the track,” said Sykes. “I wanted to keep some on the tyre. When asked why this year all the rider with the exception of Rea are having so many ups and downs, Sykes had some insiders insights to explain. Some others do not have that consistency across the board, says Sykes. “Some of the other manufacturers are still specialising in certain areas, where the Kawasaki, when it was developed in those early years, we kind of tried to tick all the boxes. “Some boxes we miss out on now, sure, like stopping, we are not quite as keen at stopping as some of the other guys, but we make up in other areas. Consistently, we might not be a ten in one area, but we are nine across the board. So, this is hard for other manufacturers to beat.